Known for his famous Disney Discovery Series, which quickly sold out in 1996, Tom duBois is also noted for his wonderful paintings of various religious themes. His passion for life shows in his work, whether it’s his art, music or storytelling. This particular work of his shows an angel in flight, with a candle in one hand, representational of her role as the “Angel of light”. Light in this work symbolizes divine guidance, wisdom and love. This work is wonderful in its composition, use of color and presentation. 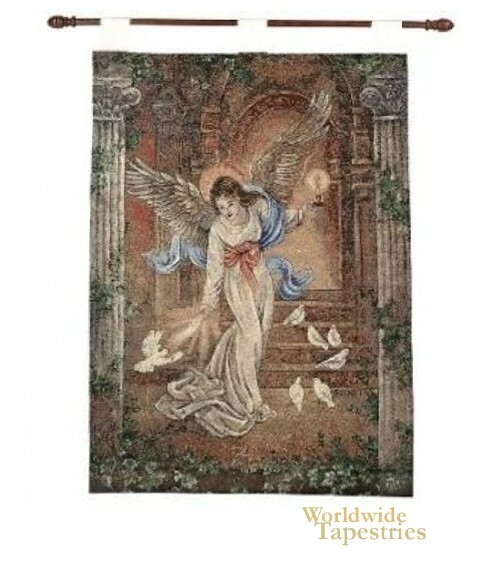 If you enjoy the classic works of religious art, you’ll love duBois’ “Angel of light” in your home or office. This tapestry is lined and has tabs for easy hanging. Note: tapestry rods, where pictured, are not included in the price.